All it takes are some gene samples and a bit of machine learning. Every single piece of information about us is contained in our genes. It turns out, our genes can also provide clues about when, precisely, we die. A study from the Center for Genomic Regulation (CRG) in Barcelona, Spain surveyed the gene activity that occurs in human tissue after death, and found distinct patterns that could be traced back to a person’s time of death. The results, published in the journal Nature Communications, came from a combination of extensive sample analysis and machine learning. In order to determine the changes in gene activity that took place after death, CRG computational biologist Roderic Guigó and his colleagues took 39 tissue samples from 9,000 donors. These came with information about a donor’s time of death and when the samples were preserved. “The response to the death of the organism is quite tissue specific,” Guigó told Science. After death, over 600 muscle genes either quickly increased or decreased activity. Meanwhile, there was minimal change in gene activity in the brain or spleen. Guigó and his team used the unique patterns of change in each tissue to backtrack to a person’s time of death. In order to measure how accurate such a prediction could be, they developed a machine learning model that analyzed the gene activity patterns of 399 people. The software, which they tested to predict the time of death of 129 other people, showed that the majority of increases and decreases in gene activity happen between 7 and 14 hours after death. One example is in blood, where decreased gene activity involved in DNA production, immune response, and metabolism indicated a time of death around six hours before samples were preserved. Guigó and his team’s study was possible thanks to recent advances in genetic analysis facilitated by recent studies of the human genome. In any case, this work is only the beginning of what can the researchers can accomplish by harnessing genomic clues. “At this point, our program is an academic exercise,” Guigó told Science, adding that it might even be possible for changes in gene expression to provide signatures indicating cause of death. The ability to pinpoint an exact time of death would undoubtedly prove quite useful in forensic analysis. 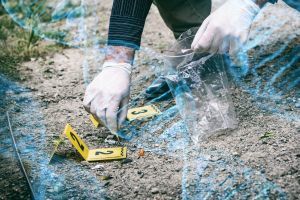 But being able to pinpoint cause of death using a deceased person’s genes would eliminate much of the uncertainty surrounding criminal investigations, and possibly even expedite them.